Tim Holmes certainly looks the part of Strongman! Seeing that it’s Fit Bottomed Dude’s Week and all, we wanted to do a special FitStars interview. One that would wow and inspire the girls and guys alike! And, peoples, we have it today! We scored an interview with Tim Holmes, who is starring as Strongman in the movie Oz the Great and Powerful that’s in theaters now. 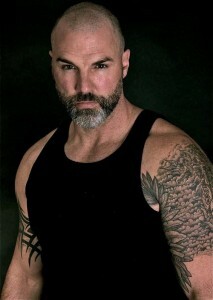 Tim has been an action-suspense actor and stuntman and—after taking off some time to raise his 3-year-old twin boys—had missed a workout here or there to focus on being a father. When he landed the Oz role though, that all changed. To live up to the “Strongman” name, Tim ended up putting on 25 pounds of muscle in three months. Three months! Read on for more on how he did it naturally, what his workouts were like and what the whole experience and role taught him! FBG: How did you go about gaining 25 pounds of muscle? TH: Gaining 25 pounds took me a total of three months to do. It was not all muscle though, a lot of fat was there, as well. The first thing I did was go to the local health food store and ask the guy with the giant muscles who worked there what I should buy. He helped me create a routine that included about 20 pills a day, weight-gain powder, protein powder and creatine. I ate all day long; ice cream weight-gain powder shakes, red meat and every carb you can imagine. I worked out seven days a week using all free weights. I did five exercises for every body part, each with rep sets of 12-10-9-8, using the heaviest possible weight I could lift. I used a lot of people to get those heavy sets done. FBG: Did you do it in a healthy way? TH: I was under a serious time crunch while preparing for my role in Oz The Great and Powerful. The only thing healthy about the way I prepped for this role was by avoiding steroids. Steroids may have been a quicker and less costly option—but that’s not for me. Not to mention the fact that my wife would leave me, in a heartbeat, if I did steroids. That alone is a no-brainer. Heck, I got her to marry me; I’m not going to blow that by taking steroids just to get big. Just go to the gym every day and take supplements from a health food store—it will happen that way soon enough. FBG: How did it help your character? TH: My character is a strongman in a traveling circus in the 1800s. In my research of carnival strongmen, I found that these guys were just thick, no-necked, barrel-chested men who could lift a telephone pole and throw it at you. To pull off this character, I had to look like that kind of guy—not a ripped-up shredded body builder but a large lumberjack-looking guy. When I started training, I weighed 220 pounds and by the end of those three months of training, I maxed out at 245 pounds. When you add that much weight to your frame, you walk different and feel different. I also let my beard grow out. Combine that with the amazing Oz wardrobe, which was a one-piece wrestling-type leotard, with leather wrist guards, a huge leather belt and gladiator-style lace-up boots, and you become the Strongman. I also kept pictures of carnival strongmen throughout my dressing room, at my home and on my phone. I would frequently look at these pictures to draw inspiration and keep focused on the personality I was trying to emulate. FBG: You have twins—how did you fit all of the workouts in? TH: My twin boys, Dashiell and Grayson, were a year-and-a-half old when this film was shooting and were too young to take to the gym daycare. I would go to the gym when they went down for their afternoon nap. Sometimes, I would go again in the evening after they went to bed at 7 p.m. Now, when I train, I take them to the gym with me. They have a really cool child care area with tons of climbing toys and other activities. They love going to the gym with me and playing at the daycare. FBG: Now that you’re done filming, what does your workout routine look like? TH: My workouts have changed drastically. The only supplement I take now is protein powder. I train only four days a week, lower weight, with three sets of 12 to 15 reps with four exercises per body part with a lot of cable machines, as opposed to all free weight. I also do at least 30 minutes of cardio every time. FBG: Are you planning to keep the muscle? TH: I have kept most of the muscle and lost all of the fat. It is really hard to lose all that fat. That part is not fun. Gaining weight, eating whatever and whenever I want is FUN!!! It’s not healthy though. I have kids now, and I want to be around for my grandkids, so I need to make better choices. FBG: What did you learn from your experience? TH: If you have a goal and set your mind to it, it will happen. Be patient and persistent, and do it every day no matter how you feel. The experience on the film set was amazing. Working with Sam Raimi was such a mind-blowing experience, as he is one of my film-making idols. I would sit behind the camera in costume with my headphones on playing music and just watch this filmmaker work. I observed how he talked to his crew, set up his shots, talked to his actors to get what he wanted out of them. I learned so much in the time I was there watching Sam Raimi work his magic. On set I was also greatly influenced, as an actor, by watching James Franco between his takes. He always had a book at hand and took every opportunity to read it. It was a different book every day, but it always pertained to his character development. He was always focused on developing his craft as an actor. I have tried to incorporate the many facets of what I have learned into my filmmaking projects. I currently have a movie in pre-production that I wrote, shot, edited and am the lead actor in, titled Detroit Riders. It’s a biker movie set in Detroit, Michigan. You can see a trailer of it on my website, www.timholmes.net. Most importantly, I learned to be so thankful and humbled to be hired by someone to be an actor. It is truly a desire of mine, and I do not take it for granted when I am working as an actor. Just be thankful. FBG: Anything else you’d like to add? TH: Never give up, never give up, never give up. If your dream is to be a filmmaker or actor, you are never too old. I finally got my big break at 44, and I have been in this business since I was 18. I took some time off from the acting end of the business and studied the behind-the-scenes part of the business: writing, shooting, directing and editing. Always practice your craft when you are not working by being involved in theater plays or scene-study classes. Always be honest about the things you do. People in this business are very smart and know when you are BS-ing them. Put God first, then family, then work. Never compromise your passion for your art for money (as in, don’t take that crappy acting gig because it’s going to pay you a lot of money). Nuff said. God bless and thanks for reading. I know you will love this film Oz the Great and Powerful. It is a great classic family film good for all ages 5 and up depending on the child. The flying monkeys are pretty scary—that’s about it for scary parts though. Dude, we love how honest he is about how he did it (and how he didn’t do it), how tough it was to lose the fat and how to survive in Hollywood! What a fun peek into that movie, too! And he sounds like a pretty darn cool dad, huh? I needed this today 🙂 From all the aspiring actors out there we thank you! Being an older guy you would have been able to walk into a qualified TRT doctors office, had some tests and got a prescription for yes…. steroids and done it the most healthy way. Building that muscle without all the fat. So mush false and incorrect information out there. Talking of TRT and improving ones health, HGH is the fountain of youth and has amazing anti-aging benefits. Including more energy, increased stamina, better skin, better mood and general wellbeing. The benefits are amazing and life changing for many people. Enjoy a better quality of life and increased vitality!